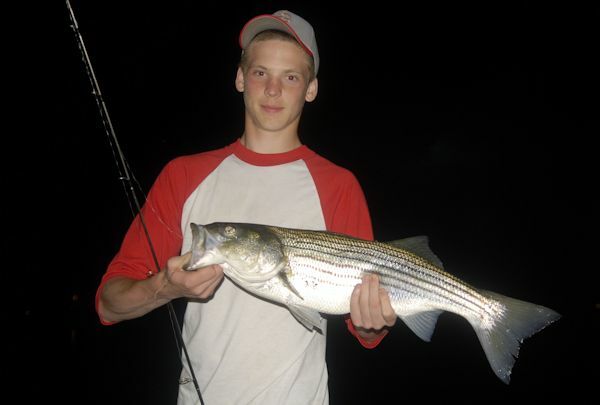 Ryan Schlichter shows off a typical late night school striper caught and released on a shallow flat. Photo by Tom Schlichter. It was a perfect cast, thank you. You know the type; the one that lands right where it should; the kind you just know will force a strike. Only this cast was made late at night – 2:00 a.m. to be exact – and I knew it was spot-on from sound and feel, not from sight. As the coal black lure hit the surface, I squinted into the darkness, trying to pin-point its exact location. I zeroed in on it and the charging wake almost simultaneously. I popped it once as the sharp vee cut a path through the long, silver sheen of the moon’s reflection across the smooth surface. By the second pop I was into the fish. The entire scene took place in a surrealistic silhouette. There’s something about fishing at night that makes every fish you hook seem larger than life. The false image is intensified in the shallows as the fish expends its energy cutting up the flats and rolling on the surface instead of diving deep to sulk or bury itself in some unseen underwater obstruction. This fish was no exception. It slammed the lure at full charge and set my rod into a tight arch. The drag screamed, I cheered and the surface erupted with a dozen pounds of striper impersonating a 20-pounder. As I lifted the bass by the lip from the water to remove the hook, it shimmered in the bright moonlight. I held it aloft to admire for a second or two, centering it against the full moon, imagining myself on a magazine cover, but there was no one around to snap the photo. With a twist of the hook from my fishing pliers the fish was gone. No doubt, she would beat a path back to deeper water and sulk for a tide change or two before deciding to feed again. It would probably be quite a while before she dared to venture back on the flats. Catching stripers, bluefish or weakfish at night is always exciting. Catching them on poppers while probing shallow flats adds another element that only increases the fun. During the day, most predator fish spend their time in channels, holes, and deep water tight to structure. Here, with plenty of hiding places and a few feet of liquid over their heads, they feel secure. The same spots also usually produce at night, and in fact, may be even more productive than during daylight hours. To fish them, however, means jockeying with other boaters and working over schools of fish that probably see an array of baits and lures every other tide. You can work these traditional hot spots with traditional methods – drifting eels, casting bucktails or anchoring up to clam chum – and score well if you put in the time. For a change of pace, however, you might want to try moving away from the fleet and having the fish all to yourself. It’s a bit of a gamble but the pay-off can be huge. When the sun goes down, stripers, weakfish and blues come out to play in their favored haunts. But some fish, like some fishermen, prefer to be off the beaten track. Often, these fish will expand their range by following rising tides up onto shallow flats. With the sun eliminated, and boating traffic at a minimum, the fish feel secure enough to venture into as little as a foot or two of water where they scrounge around for crabs and small baitfish – and they do it more often than you might think. Some nights the flats are alive with hundreds of fish. 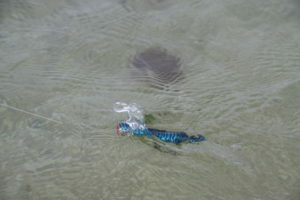 Choose small poppers for working water depths of 2 feet or less. Work them at a medium speed. Photo by Tom Schlichter. 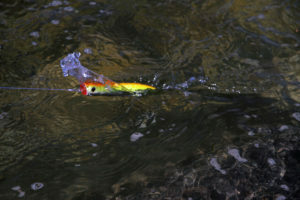 Larger poppers can be used on flats covered by 3 or 4 feet of water. Photo by Tom Schlichter. Not all flats areas will hold fish for popping. Thus, the first thing you need to do to get in on this fun is isolate what should be the most productive water in your area. Begin by looking for fairly large, sand-based flats that parallel deep channels or structure. Flats that begin within 300 yards of a bridge are a great example of productive water, being close to the deep water of a bridge channel and structure at the same time. Large shoals located just inside an inlet are another potential hot spot. In back bay areas, look for flats that run along a main channel, flats adjacent to a substantial tidal creek, or flats that are drained by deep cuts. Naturally, any flats that lie within 100 yards of a well-known daytime hot spot should also be explored. Now that you’ve identified a few potential fishing spots, narrow down the field a bit more. Check to make sure that these flats are alive, not barren. A “live” flat will hold crabs, horseshoe crabs, shellfish beds and small baitfish. Flats sporting patches of eel grass tend to be especially productive. Those that are bordered by bulkheads can also be very good. Flats where clammers tread or donkey rake are always potential fish havens. Flats bordering marshy islands are also excellent choices. I especially like to work these as most feature small drainages that allow bait to be sucked from shallow troughs and right onto the flats that border their perimeters. Look specifically for flats areas where the water tops out at less than three feet deep at high tide. In other words, search for very shallow flats. Also, a fair amount of current should push through the area. No current, no predator fish – it’s a simple as that. As a rule, the best flats are sandy, or sport a fine sand/mud mix. Dark muddy waters generally don’t produce well for popping at night. The best way to find productive flats is to map them out on a chart, then take a day-trip at low tide. Note any cuts, humps, drains, pockets, eelgrass beds or points – mark them on your map or plug in the GPS co-ordinates as these are potential hot spots. Note also, just how far you can safely get up on the flats with your boat. In many areas, you’ll simply have to skirt the perimeter and cast to shallow water from the channel edge or cut. Some flats, however, will allow you to drift across on the flood. Because the waters you’ll work are exceedingly shallow, they’ll tend to hold smaller fish than traditional big fish hot spots. That’s just fine if action and fun are the goal and you don’t feel any pressure to land a lunker. As a rule, stripers in this scenario will measure between two and eight pounds with an occasional ‘teen or 20-pounder tossed in just to keep things honest. Although you may be able to find a few fish on the flats on any random night, the best action for popping with surface plugs strongly coincides with “moon” tides. From three days before the full or new moon to three days after, the fishing seems to hit its peak. I prefer the full moon phase because it is easier to see your lure, pole along, track your drift and spot tell-tale ripples on the surface that indicate feeding or cruising fish. 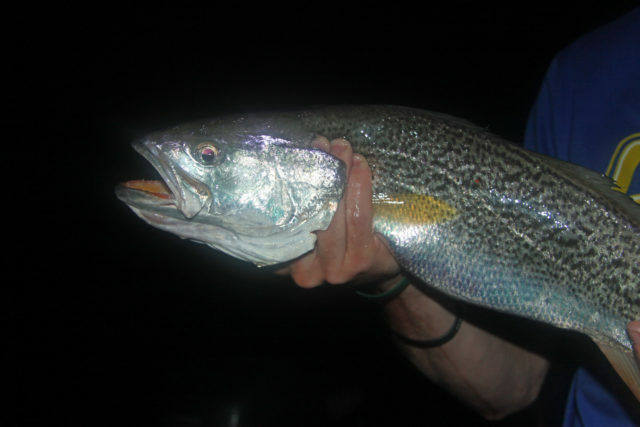 Weakfish sometimes prowl the shallows in June. They are a welcome surprise amongst the bass. This one was released immediately after being photographed. Photo by Tom Schlichter. One of the most important ideas to keep in mind when preparing to pop the flats is to approach the fishing grounds quietly. The fish here are a bit outside of their usual comfort zone and can be quite skittish. Because of this, I like to come in at a crawl, position the boat at least fifty yards uptide of my target area, cut the engine, and drift in or pole quietly up onto the flats. Keep your chatter to a minimum as you work along, and if you do land a fish, try to release it without letting it bang around in the boat. On nights when the schools are thick on the flats, I’ll sometimes drift in then anchor up and cast at a quarter to the current. In some marshy areas, I might even use a grappling hook to secure my vessel to the land. As you blend quietly into your surroundings, and your eyes and ears adjust to the darkness, the fish will begin to reveal themselves with surface slaps, swirls and an occasional bonafide surface explosion. Give yourself some time and you might even begin to spot a few tails or fins in shallow water, allowing you to sight-fish at night. The tackle you’ll need to pull off this late-night, shallow water popper action is relatively light. Any sturdy 6-1/2- to 7-foot spinning stick capable of handling 12 to 17-pound test lines should do well. The prime requirement is that the rod tip have enough stiffness to “pop” your lure across the surface. For the most part, you’ll be casting poppers in the one-half to three-quarter-ounce range. For slightly deeper flats that may hold a few larger fish you can beef up your gear a bit and work poppers ranging in weight from one-half-ounce to two-ounces. Among some of the lures you might want to try are Yo-Zuri Hydro Poppers in sardine or black/silver, Gags Grabber Hologram Poppers, white and blue Rebel Windcheaters and the SPRO Chug Minnow 35 Topwalker in silver/black or shad patterns. Any of these should measure two-and-a-half to four-and-a-half inches long. Fly-rodders will score well with a nine-foot long, ten-weight rod. Lime green or Frenzy poppers work well but any black or white popper should work in a pinch. Surprisingly, you can crank a popper fairly fast and still connect when fishing on the moon. In fact, a medium-speed retrieve seems to work better than a slow and deliberate one on most nights. The key is in the cadence. Pick a speed for each retrieve and keep the lure popping back to the boat at a steady pace. This way, the fish can respond to the sound and anticipate where your popper should be as they race to intercept it in the darkness. As for lure color, the basic rule is dark colors on dark nights, light colors on light nights. Between you and me, black, white, dark blue and silver seem to work under almost any conditions. I give the edge to black as it is slightly easier to track in the darkness and probably offers the fish a better silhouette as they approach from underneath. Popping the flats works best at the top of rising tides and the first two hours of outgoing water. On a calm, quiet weeknight, you might even be able to take your first few fish at dusk – a great way to start if you are new at this game. Anytime you head for the flats at night be sure to drive slowly, be aware of your surroundings, and let someone know where you will be and when you should return. Obviously, a flats style or shallow draft vessel is preferable for this kind of fishing. Larger boats and deep vees should stay in the channels and cast along the fringes. If you draw less than a foot, you might carefully drift or pole well up onto most flats. Will you catch a lot of monsters popping the flats? No. Will you catch every time out? Again, no. But you will have the fish to yourself when they do show and, if they don’t, you can always crank up the engine and head back to fish among the crowds.